The Chinese Ministry of Defense paper, on the other hand, begins with the claim that although the international system is generally calm and on a peaceful trajectory, Chinese security is adversely affected by “new threats from hegemonism, power politics, and neo-interventionism.” It goes on to describe the “rebalance” and the meddling of external countries in the South China Sea as having negative impacts on China’s security. The meddlesome, neo-interventionist hegemon is, of course, the United States. That the U.S. is front and center as a security threat in the Chinese strategy while China is buried at the back of the U.S. document is in itself worth contemplating. A more obvious disparity is the language with which the two documents describe the phenomenon of deep U.S. engagement in the region. The NSS, for example, describes the U.S. in rather different language. In his preface to the document, President Obama argues that “strong and sustained American leadership is essential to a rules-based international order that promotes global security and prosperity as well as the dignity and human rights of all peoples.” The document’s section on the “rebalance” discusses both the deepening and broadening of economic and security ties to Asian nations. That one man’s leadership is another man’s hegemony is hardly surprising, especially when considering that “hegemon” in truth means “leader” but has over time come to be used in ways meant to invite disapproval. However, the criticism implied in the white paper may be harsher than most Americans realize, since there is in fact no real concept for “hegemony” in Chinese—the word from the white paper that is rendered as “hegemony” is really a word for “tyranny.” Political scientists or leftist critics notwithstanding, Americans rarely think of their foreign policy as hegemonic, and it isn’t always clear to Americans where others would draw the line between legitimate leadership and self-serving hegemony. Along these lines, it was interesting to observe how in his book The China Dream, Liu Mingfu attempts to differentiate a “champion” state like China from a “hegemonic” one like the U.S. In the end, Liu’s description of the benevolent champion is quite close to many Americans’ visions of U.S. leadership. Nonetheless, the language of the white paper should once more remind Americans to be attentive to how their activist foreign policy is perceived around the world, and reflection on the “neo-interventionist” label is a good place to start. The degree to which American unilateralism and interventionism has alarmed people around the world, including in China, appears to be underappreciated in the U.S. In fact, the term “neo-interventionist” has no real currency here, although it doesn’t take long to guess that it refers to the sequence of U.S.-led interventions that have challenged any simple interpretation of the UN Charter’s prohibitions against intervention. A recent article by Wu Zhenglong illustrates these problems of “hegemonism” and “neo-interventionism” as constituting threats to the strict principle of Westphalian sovereignty around which the United Nations was built. Wu associates these challenges to the UN order—centered around the prohibition of interference in domestic politics and military intervention—with such principles as “human rights above sovereignty” and “responsibility to protect,” also known as R2P. For its part, the United States’ NSS overtly confirms the R2P principle—according to which a sovereign state is rightly subject to intervention by the international community if it fails to respect basic human rights—and continues the longstanding tradition of embracing democracy promotion as a pillar of U.S. foreign policy. The R2P issue sheds further light on disparities between U.S. and Chines visions of rules-based order. Both Chinese and American statesmen advocate such an order at every turn, yet there are problems lurking in the difference between laws and norms, how rules are applied, and the necessity and nature of “leadership” in their maintenance. While proponents of a strict adherence to sovereignty like Wu focus on the legalistic character of the UN Charter, Americans often operate according the logic exemplified by the International Independent Commission on Kosovo’s “illegal but legitimate” description of the 1999 Kosovo intervention. That is to say, by supporting R2P, the United States invokes an alleged international consensus around deeper norms when international positive law is supposedly inadequate (although the R2P concept does seek to derive intervention authority from the Charter). This vision of rules-as-norms creates clear difficulties with regard to the question of formal order. First is the obvious problem that loose interpretations of rules are likely to be self-serving, thus undermining the “legitimacy” envisioned in the Kosovo Commission’s formulation. For the United States this means that activities it imagines to be altruistic or otherwise legitimate will be viewed with skepticism in China and elsewhere. A second problem is that the use of norms to override laws presumes that there is some kind of critical consensus about universal values, or that the international system is cohesively evolving towards some set of norms, and thus good leadership entails taking action to support these values. In this view, the United States is a natural leader, since visions of allegedly universal values typically align closely with Western, liberal ideas. The Chinese vision articulated by Admiral Sun at the Shangri-La dialogue clearly promotes a different vision of ordering principles, one which presumes an inherently pluralistic world in which there is less consensus on deeper values. Instead of focusing on promoting certain norms or values, Sun emphasized the importance of “mutual respect” and “inclusiveness” for fostering productive international relations—what some thinkers call a “thin” system of shared principles as opposed to a “thick” one. This question of how “thick” the content of international politics should be arises frequently in U.S.-China relations in a number of ways. U.S. officials sometimes present the Trans-Pacific Partnership (TPP) as an embodiment of shared values between the U.S. and various partners, and emphasize the importance of “standards” both in the context of the TPP and its criticism of the Asian Infrastructure Investment Bank. 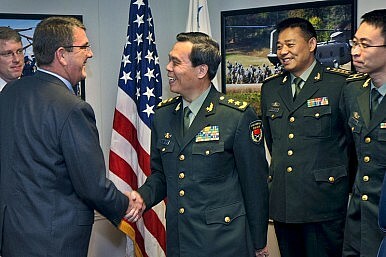 At Shangri-La, U.S. Secretary of Defense Ashton Carter emphasized the set of principles that has grown around what he called the Asian “security architecture” and implied that Chinese reclamation in the Spratly Islands was violating some more substantive spirit of regional cooperation, even though an unspoken premise of this argument was that such activities are nonetheless technically legal. Admiral Sun, by contrast, seemed to take the position of the “letter of the law:” he presented Chinese activities as not problematic and manifestly legitimate, and rejected the imposition of other nations’ “subjective preferences.” In anticipation of this last charge, Secretary Carter seemed to make great effort to present the U.S.-led “architecture” as a consensual order of genuinely shared values, where the US was a “partner,” not an arbiter. Both China and the U.S. need to be conscious of the thick/thin and legal/legitimate dichotomies at a time when international order seems to be at an inflection point. The United States will always advocate democracy and human rights as key values, but in a pluralistic world it must work to develop principles that can help build more substantial relationships with nations that aren’t liberal democracies. As Kevin Rudd has pointed out, Chinese strategic mistrust of the U.S. derives from the impression that America “…has not and never will accept the fundamental political legitimacy of the Chinese administration because it is not a liberal democracy.” Americans must be aware more generally of how sometimes what they regard to be “universal” principles, others regard as domineering “American” or “Western” values. American policymakers should also keep in mind that if the world is to evolve towards thicker conceptions of international order—ones that can focus on more on substance and rely less on formal or procedural understandings of a decent international order—multilateralism plays an essential legitimating function. Chinese policymakers, for their part, should bear in mind that a thicker principle of legitimacy is often at work international relations, which by nature are more political than legal. China’s protestations regarding the legality of its recent reclamation activities, no matter how well grounded in international law, completely talk past the concerns of potentially affected parties. Unilaterally making formal legal arguments isn’t nearly as constructive as demonstrating a willingness to use international law as a way to settle disputes. It is interesting to observe that parties in both the U.S. and China regard the other country to be “revisionist” and consider their own nation to be a conservator of a certain rules-based order. It would be encouraging to see both nations to work towards closing this perception gap, with a view towards building a more substantive consensus on principles of order that are genuinely universal and inclusive. In the meantime, if both nations were more conscious of just how “rules-based” their actions appear to be in the eyes of others, we would all be a little better off. Alek Chance is the coordinator of the China-U.S. Cooperation Program at Institute for China-America Studies. This article has previously been published on the Institute for China-America Studies blog.